Heat the oven to 400°F. While the oven is heating, season the beef as desired. 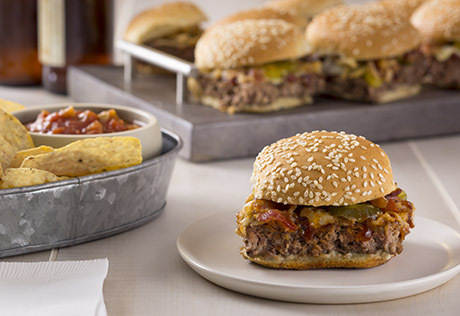 Press the beef in an even layer to cover the bottom of a 13x9x2-inch baking pan. Bake for 8 minutes or until the beef is cooked through. While the beef is cooking, place the buns onto a large piece of aluminum foil (leave extra on either side of the buns- enough that you'll be able to fold the ends over top of the burgers). Remove the buns from the package all in one piece (don't separate them). Cut through the joined buns horizontally to separate the tops from the bottoms. Set aside the tops. Using 2 spatulas, lift the beef in one piece out of the baking pan onto the bottom buns. Pour off any liquid from the baking pan and wipe clean. Place the foil, buns and beef back into the baking pan. Spread the barbecue sauce over the beef. Layer with the cheese, bacon, onions and pickle, if desired. Top with the top bun halves. Fold the ends of the foil over to cover. Bake for 5 minutes or until the cheese is melted. Lift the the foil and burgers out of the pan to a cutting board. Cut to separate into mini cheeseburgers.